LIM lighting from Haworth (all images courtesy of respective manufacturers). The mood was noticeably subdued at this year’s NeoCon World’s Trade Fair in Chicago, which ends today, but many attractive and innovative new products were introduced. For our special Midwest issue we offered a preview of things to look for at the show. Here are a few additional products that stood out at the Merchandise Mart. 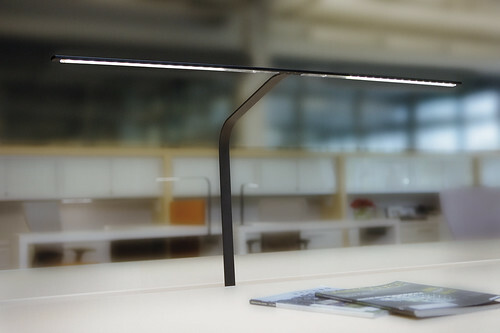 Designed by Pablo Pardo of Pablo Design and the Haworth Design Studio, LIM is an ultra thin aluminum LED task light. LIM is available in desktop, slot or panel mount, and floor-based versions, and is 85 percent more efficient than comparable incandescent lamps. The minimal design keeps sightlines unobstructed and desktops uncluttered. 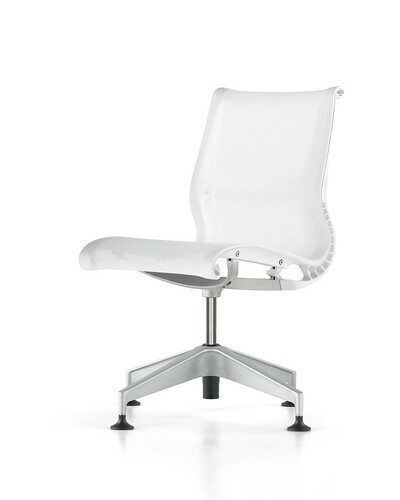 The profile of the new Setu chair evokes the classic Eames Aluminum Group seating, but the plastic spine—polyester to be exact—bends and tilts with the body, unlike the more rigid Eames design. Designed by Berlin-based Studio 7.5, Setu’s spine also includes a high level of recycled content, and is one of the more affordable multipurpose chairs in its class and weighs less than 20 pounds. It is designed for office and home office settings, and includes versions with and without arms, as well as an ottoman and lounge version. It is available to the trade now and will be sold at retail stores beginning in September. 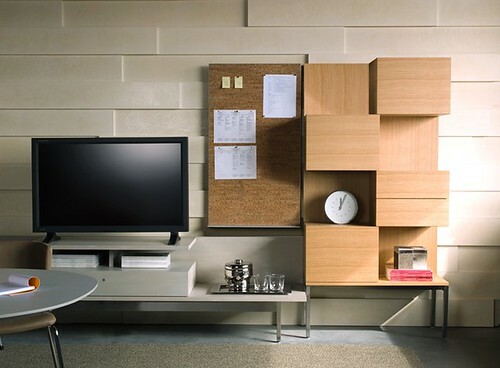 In keeping the Coalesse’s idea of blurring the boundaries between home and office furnishings, the Denizen case goods system brings a distinctly residential feel to private offices. The series, which includes a secretary, tables, benches, towers, overhead storage and display storage, is available in oak, teak, and ash gray. Designed by WilliamsSorel, Denizen’s strong lines and high quality materials make it appropriate for a office/guest rooms or living areas. 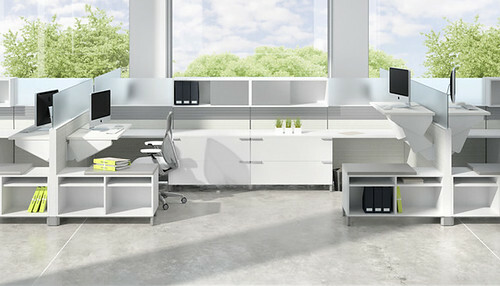 Many of the office systems at NeoCon had clean, horizon lines (unlike all those curvy systems aimed at tech start-ups in the early 2000s), but one of the best looking was Stride from Allsteel. The surfaces have a thin outer edge, but are actually thick and sturdy, thanks to a stepped back design. The system is a kit of parts that can be adapted to a variety of configurations, from traditional cubicles to shared more, open arrangements. Available in a variety of materials, the painted wood storage units in particular feel more like furniture than parts of an office system.